Height Option? : Under 5' 6"
CoreChair is the Healthiest chair in the world. 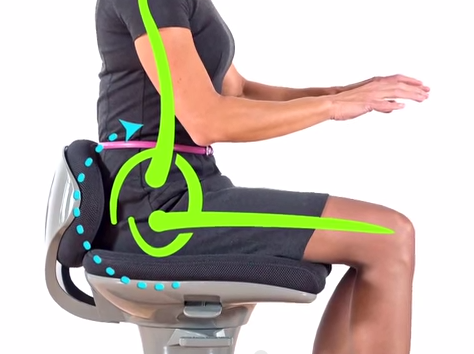 CoreChair is a new way to sit and stay active. Adding CoreChair as a part of a healthy lifestyle is the best thing you can do to take your health to the next level. Despite the various aesthetic and engineering changes typical office chairs have undergone through the years, they all have been denying us the one thing our bodies were built to do: MOVE. 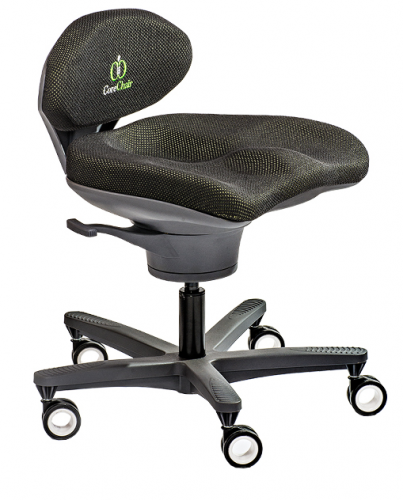 CoreChair is not your traditional office chair. We're breaking the mold with a revolutionary design that encourages active sitting. Let’s face it – chairs have pretty much been the same since, well, forever – meaning the way we sit hasn’t changed over time, either. When humans first sat down, we unintentionally stopped moving, and we’ve been practicing sedentary sitting ever since. Fast forward to today, where more and more studies are being released, revealing that the average person spends between 9 and 13 hours a day sitting. Sitting is the greatest thief of movement, and extended periods of sitting affect morbidity. The truth is, our bodies are simply not meant to maintain a static position for long periods of time. With the rise of desk jobs, TV, and computers, sedentary sitting has become a real problem – one we’re determined to solve. If health is a relationship between you and your body, then why should sitting be an exception? You know a thing or two about health, and you’re aware of the impact sitting has on us. But have you ever thought of sitting as an activity that’s actually good for you? We’re on a mission to change how people sit for good, so it stops being the cigarette of the workplace. Think about how long chairs have been around, and how little they’ve changed. The invention of the standing desk is surely a step in the right direction, but standing all day poses its own set of health hazards. Sometimes you just have to sit, but we believe that just because you sit, doesn’t mean you have to sit still. Having a healthy workplace should be at the top of everyone’s priority list! Think about the amount of time you spend there. The average person works for 9 hours per day. That’s a major chunk of your waking hours. If you could make some small changes to create a healthy workplace at your office, would you do it? In an office environment, making some changes can be inexpensive and very beneficial to your employees. These are not necessary changes that can just affect the health of individuals; it can promote teamwork and activity throughout your office space. A new design mentality called “active design” is taking over and working to create a healthy workplace. Simply adding some tall tables in common areas can promote individuals coming together to collaborate, as well as getting them up out of their seats. They could choose to bring over their laptop and work for a time while standing up. While just a few tall tables do not automatically mean you have created a healthy workplace, it is a step in the right direction! Equipping your office with alternatives to traditional seating is also a great step in the right direction. Active sitting chairs can promote movement throughout the day, which keeps your employees engaged and healthier. Or, try having short stand-up meetings among employees. You’re bound to keep mindless chatter to a minimum, all while getting people onto their feet. You can also promote a healthy workplace by allowing employees different spaces in which to work. Larger companies could consider some quiet areas and other team-based areas to facilitate different types of workers. This could lead to less stress for people who find it difficult to concentrate on certain elements of their job while in loud or distracting areas. Furthermore, if your employee doesn’t feel confined to a small cubicle, you’re promoting their regular movement throughout the day. Even getting up and walking to different stations in the office can help to increase their movement and work to create a healthy workplace. With the increasing costs to health care, especially the rise in obesity-related illnesses, creating a healthy workplace is something that your employees will appreciate, and looks after your bottom line. Having good posture has a lot of health benefits. We have talked about many of these before. However, this is becoming an increasingly hot topic and more research is coming out almost daily. The benefits of good posture are exhaustive to list, but these new findings are too interesting not to share! Seriously—you read that correctly. Studies have concluded that people who assume power positions have higher testosterone levels and lower cortisol levels than those in passive positions. Standing or sitting up straight and having good posture is a classic power pose. Those who are in more passive or submissive postures tend to have slumped shoulders, crossed arms or legs, and chins tilted downwards rather than looking straight ahead. This power makes you feel more in control. Having control of your life is a powerful feeling. Think about it—those who are defeated, depressed or stressed typically display body language that projects those feelings loud and clear. People who practice good posture and assume powerful poses rather than passive ones feel more powerful overall. Furthermore, those people are more confident in their decisions and are 45% more likely to take a risky bet! While there have been conflicting studies about whether to sit up straight or to lean back at certain angles (some experts say 110 degrees; others say 130 degrees), the main point we try to drive home is to maintain activity throughout the day. Active sitting is a great way to keep moving throughout the day. Furthermore, active sitting chairs are able to promote good posture without having it feel forced or unnatural. Keeping active by taking regular breaks throughout the day can even help to ‘reset’ your good posture when you sit back down again. This is especially pertinent to those who spend long hours in front of a computer, as you’re more likely to have your neck craned forward. This can effectively destroy any chances at good posture because the next inclination is to slump the shoulders forwards. If you’re looking to feel more powerful and in control of your life, good posture is the easiest way to do it! If you’ve been sitting down for a long time at the point where you’re reading this article, get up and take a break. Reset your good posture and take control of your day! 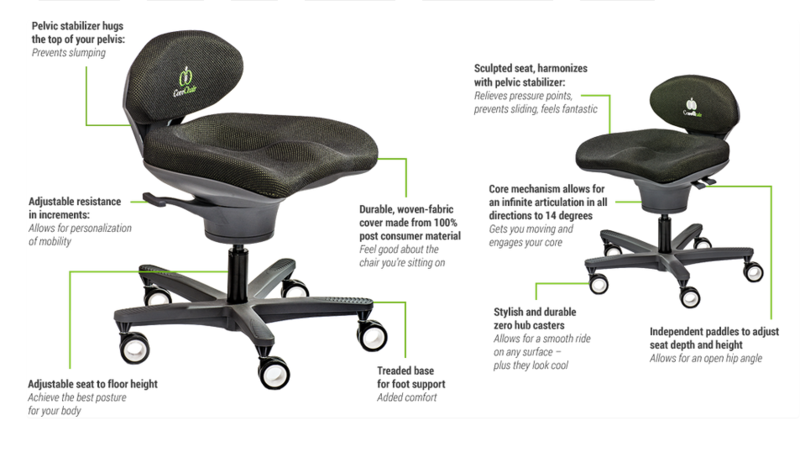 CoreChair helps you look better, feel better, and live better by delivering high-performance active sitting. 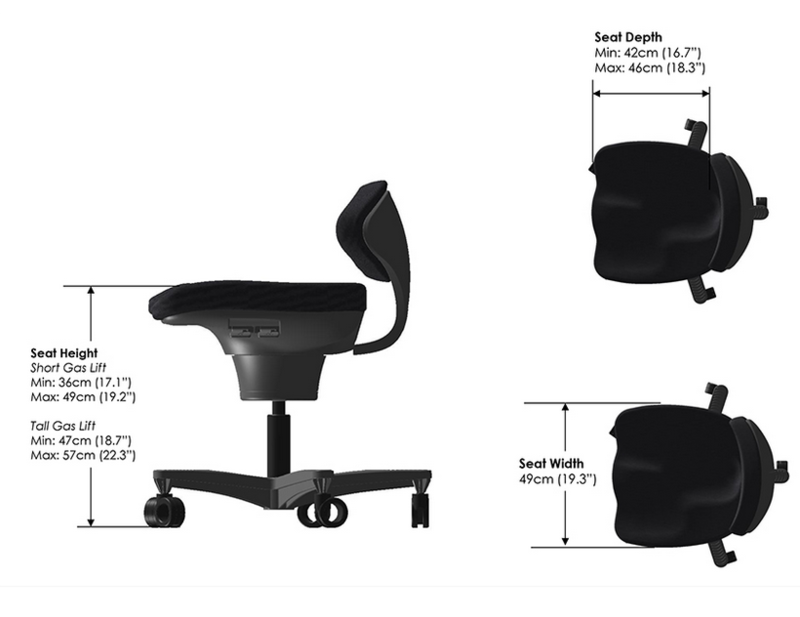 While the design of the CoreChair seems very intuitive, we felt the need to both validate the concept and determine what new information would add to our design process. The most obvious approach was to contact the U of Waterloo Department of Kinesiology and the renowned Dr Jack Callaghan PhD, Canadian Research Chair and experienced. mayo-clinic The Mayo Clinic at Arizona State University campus is in the process of invesitgating the caloric burn of sitting in a CoreChair and their findings to date look very encouraging. List has designed some workouts you can do at your desk. To show you that they are work ready we brought in Pam in her office attire and she does the exercises with Lisa. Now that we are all hearing about how sitting is the new smoking and how our office chairs are killing us, many people are starting to stand up (literally!) and take notice. There has been a huge shift to in standing desks in the recent years and this trend will no doubt continue to take hold. We know that sitting all day is bad for us… But standing all day is bad as well! So how do we reconcile this? The skinny on standing desks. It’s true that standing burns more calories than sitting. It’s also true that standing desks can promote an increase in calorie burn rate, as well as lower blood sugar levels after eating. It seems to be transitioning well into the workplace too, with many online tips and tools on how to MacGyver your own standing desk. There seem to be two pretty distinct schools of thought on this… And guess what? We’re not picking a side! The new trend of standing desks is so prevalent, we had to stand up and take notice!The new trend of standing desks is so prevalent, we had to stand up and take notice! While we promote active sitting within our product and believe that it is a great alternative to sitting in a static position throughout the day, the benefits of standing desks or treadmill desks cannot be ignored. Rather than taking a side and promoting one side of the argument, we believe that the best solution for you is one that will keep you active throughout the day. Standing desks that can transition back to traditional desks are a great idea. These can help to keep you active by allowing you to constantly change your position. And really, that’s what it’s all about! Being sedentary is really the dangerous aspect of both scenarios. Sedentary lifestyles are slowly killing us, and the best way to prevent this is to be more active. The combination of an active sitting chair and a transitional standing desk could be the perfect solution to sedentary behaviours in the office. The chair can help promote movement while sitting and the desk can allow a change of position so that the body isn’t fatigued due to excessive standing, either. Millions of people over the next few weeks will be ditching the office, campus, or home in exchange for bathing suits and flip flops—spring break is almost here. But what many people also ditch while on vacation is their eating habits and daily exercise routine, and this should never be the case. Don’t worry, you can still have plenty of time to relax, explore your destination, and indulge while also squeezing in some fitness while away. Over the years, when my family leaves the cold New York weather behind for the warmth of Mexico, I have been able to gather, through experience, a few simple ways to stay healthy and active on vacation (while feeling guilt-free when later sipping on that tropical drink!). My family and I seek refuge from the freezing temps in the same place every year, which means I’m already familiar with all that the twn has to offer. But if you’ve never been to your destination, make sure to do a little homework before you arrive. Find out if there is a fitness facility on premises or nearby. Many hotels not only have gyms, but offer classes as well. And if you are somewhere warm, there is bound to be a pool. Also check out what is nearby—you may be just steps from a hiking trail or park. Please, do NOT even think about throwing weights or any other clunky gym equipment into your suitcase. Not only is this not necessary, but lugging around heavy luggage will only result in back pain and sore muscles later on. Instead, think about adding a resistance band or a jump rope to your bag, as these can be easily packed without compromising the space left in your bag or any weight restrictions. Resistance bands are great for doing upper and lower body strengthening moves, while the jump rope provides for an excellent calorie-blasting cardio workout. If you’re staying at a large resort, chances are you have a lot to see. Clip on a pedometer or activity tracker, and get walking! The CDC recommends that you take 10,000 steps each day, so don’t fall short just because you’re on vacation. Continue to aim for as many steps as possible as you check out the many sights your destination has to offer. The options are endless these days with things you can do on vacation. Rent bikes, go on a hike, take a walking tour. Near the water? Consider renting a kayak, paddleboat, or even a surfboard for the afternoon. In the mountains? Ski, snowboard, or ice skate. Not only will you have an amazing experience, but you’ll simultaneously be burning some serious calories. Again, if you are somewhere warm, you probably have at least one or two pools at your disposal. We know it’s vacation and you like to relax (in the shade lathered with SPF) but take advantage of the warm weather and the pool or beach right in front of you. Just like I encourage you to get up every hour when sitting in the office, keep up this routine when on vacation. Every 30-60 minutes, do some laps in the pool or jump some waves in the ocean with the kids. Even walking through the resistance of the water will provide you with a decent workout. We know it’s vacation and you want to indulge in the many delicious food choices, but just be smart. If your hotel has a buffet, don’t overload your plate—our eyes are often bigger than our stomachs when it comes to buffets. Try and fill at least half of your plate with a salad or veggies and eat slowly. And if you can’t resist the French fry or nacho bar, then ditch the dessert and aim for 15,000 steps the next day! Chances are, you’ve been planning this vacation for months. Don’t get so wrapped up in sticking to your workout plan that you forgo having fun and making memories with your friends and family. But if you aim to incorporate just a few of these fitness tips into your vacation itinerary, you are sure to return home feeling relaxed, refreshed, and perhaps even healthier than when you left. My wife and I have been compiling this list for some time now, and are always looking for new ways to stay healthy and active while actually enjoying ourselves on our yearly family spring break vacation. If you have any suggestions or ideas, I would love to hear them. Please share them in the comments below! Dr. Greg is guest blogging for CoreChair, and is the CEO of Voom, a workplace wellness program designed to get employees moving. You can find Dr. Greg on Facebook, Twitter, LinkedIn, and on his blog. I’m going to give you a quick anatomy lesson: neural tissue makes up the communication system of the body. Information travels from one part of the body to another via electrical impulses passed through neural tissue, which is how your brain gets the information that your senses take in. It’s how, for example, your brain tells your arm to reach or your foot to kick. Neural tissue is the foundation of how your brain functions. According to a study conducted at the Texas Tech University, increasing activity can help to improve neural tissue health and function. Simply put: activity can make you smarter! The study, which was a team effort involving both the Texas Tech Department of Physiology and the Department of Health, Exercise, and Sports Sciences, determined that exercise increases the level of Brain-Derived Neurotrophic Factor (BDNF), a naturally produced neural biochemical that contributes to the healthy functioning of neural tissue. Having a way to promote neural health is important because, as the National Institute of Health points out, we lose neural function as we age. It’s not too late to boost your brain. Whether you are 28, 42, or 75, there are still steps that you can take to keep your brain sharp. Evidence suggests that physical activity is one of the best things to help both preserve and improve cognitive functioning. A sedentary lifestyle offers NO protection against the loss of brain tissue and neural function that seem to be a part of aging. So if you find that you are spending far more time sitting than you are active, now is the time to change that pattern of behavior. As much as you hate to admit it, and despite all of the recent negative press surrounding inactivity, there are probably still a lot of you out there that haven’t been paying as much attention to your physical activity levels as you should. Whether it’s because of a hectic work schedule, constantly watching the kids, or just the mere fact that is seems like an insurmountable task to hop on the fitness bandwagon after a significant period of neglect—it’s time to push every reason or excuse aside. Why? Because just by committing to a couple minutes of movement every hour, you will start moving down the path that leads to better cognitive function (and better overall health). If you’ve already made movement and physical activity a key component of your day—kudos. I know that it can take a lot in today’s busy world to consciously take the time to get moving. But think about it this way: you are literally saving yourself from developing a multitude of injuries and illnesses, including loss of brain functionality. And if you have room for improvement? It’s never too late. Remember that this change toward a more active lifestyle doesn’t have to happen overnight. One of the things I always tell my patients is to simply start small. If you can begin by moving around or performing a few stretches and exercises right from your chair or desk once an hour, that’s an excellent start. Gradually tack on more movement by incorporating a morning walk around the office, and advance to joining a local gym with a co-worker so you have no excuse after work. Work your way up to longer bouts of movement and exercise all day long, and you’ll be on your way to improving both your physical and mental well-being without even realizing it. And if you can take it one step further by adding a few supporting changes in your daily diet and your home routine, gradually in bite sized pieces, you’ll soon start to experience real and lasting progress. We’ve all been there. Stressed out to the point where our significant others, kids, friends, even co-workers steer clear of us until our current bout of stress and anxiety passes. But did you know that stressed out employees are less productive and unhealthier over the long term? There are obviously the immediate effects of stress; forgetfulness, headaches, stiff and achy muscles, and upset stomachs, all which can contribute to workplace accidents, injuries, and errors. But stress has a number of long term implications as well. In fact, research has found that stress contributes to disease, having a negative impact on the immune system. Stress can also increase your risk of becoming overweight or obese, and can lead to depression and other mood disorders. The World Health Organization now estimates that stress is costing businesses $300 BILLION annually. Given these astronomical costs, attributed to the loss in productivity, absenteeism, employee turnover rates, and health care costs caused by stress, it’s clear that the average workplace has become more stressful. Which is not surprising considering the economic turmoil our nation has endured over the past few years. One business writer back in 1999 even wrote, “Stress management may be business’s most important challenge of the 21st century.” And she might have been right. If you’re prone to stress, then you’re likely familiar with the “solutions.” Things like simplifying your life, prioritizing, avoiding negative people, and even steering clear of stimulants and sugar are common suggestions for reducing the amount of stress in your life. But we have an even better one for you. Clinical research from many sources has demonstrated that physical activity has a valuable role in stress management. A large majority of Americans work in jobs that limit their activity. We spend so much of our time working at a desk, sitting for hours on end, staring at computers or talking on telephones. And keeping up with work typically doesn’t leave a lot of time for distractions. So now all too often, we end up eating lunch at our desks, mindlessly munching away, only getting up when absolutely necessary (i.e. bathroom breaks). It’s no wonder that with everything going on in our busy lives, we often forget to move. Our bodies begin to ache, fatigue sets in, productivity slows, and inevitably, stress levels increase. Desk jobs are not easy jobs—they come with their own set of pains and problems. Studies have found that physical activity is an excellent solution for managing stress. And you don’t have to sneak in a 30 minute sweaty lunchtime workout either. The Mayo Clinic reports that exercise in almost any form can act as a stress reliever. In fact, getting active boosts your feel-good endorphins and distracts you from your daily worries. It seems that almost any sort of physical movement results in a reduction of the cortisol levels (a stress hormone) in the bloodstream. In addition, activity encourages deep breathing, which oxygenates the blood, and when the brain is well oxygenated by the blood that passes through it, cognitive function and mood are enhanced, and stress reduced. • If you drive to work (or even when you’re out running errands), don’t drive in circles looking for the closest spot. Instead, choose a parking spot farther away from the entrance. • Make a conscious effort to stand, walk around, or do lunges during phone calls. • Have an upcoming meeting? Make it a walking meeting instead of sitting at a conference table or in a restaurant. • Walk to a co-worker’s desk to speak with them rather than call or email. • Go for a walk on your lunch break, even if it’s just up and down the office hallway. • Break up long periods of time sitting at the computer by placing a laptop on a raised object such as a shelf of filing cabinet; while standing, do heel raises or leg lifts. • Invest in an activity tracker—research indicates that those who wear pedometers take 1,500-2,000 more steps a day than those who don’t. • Set an alarm or utilize a micro-break program to remind you when an hour of sitting has passed; perform a couple of minutes of simple stretches and exercises to get your blood flowing again. Even if you don’t stress out often or have found ways to manage your stress (and if so, good for you! ), remember to always make movement a part of your daily routine. Physical activity is one of the best things we can do for our bodies. As my brother, chiropractor, and Voom CEO Dr. Eric always says, “Movement is a necessary nutrient.” So remember to nourish it often for a stress-free and healthy life.